How Does The Glock Safety Work? Oh, how some long for the glory days when the 1911 was the first and last word in pistol safety systems before that new-fangled Glock safety system became so popular. Passive safety systems are definitely in vogue, which is why so many auto handguns have them these days. However, some wonder if they are as safe as a pistol that DOES have a manual safety. Naturally, some people aren't as convinced that a trigger safety is as good as a manual one. In truth, the Glock safety system is perfectly safe with safe handling, like any firearm is. A whole lot of pistols use something like the safety system like the Glock trigger system, largely because Glock pistols became incredibly popular. Why wouldn't they? There's a lot to like. They are reliable, versatile, simple and easy to use. They aren't expensive, either, unlike other well-known names. That said, the origin of the Glock safety system is older than one might think. The designs aren't the same, but a passive integrated trigger safety was invented and produced in the 1890s by the Iver Johnson company - the original Iver Johnson company, what with the bicycles and such. Anyway, Iver Johnson's Safety Model Automatic line of pistols (essentially Schofield revolver clones with improvements) had a transfer bar that rested between the hammer and the cartridge. The bar is linked to the trigger; it lowers when the trigger is depressed. This rendered the pistol immune to slam-fires and drop-fires, which were common mishaps of the day. Many people at the time (the first edition came out in 1894) carried revolvers with the hammer down on an empty chamber for that reason. The pistol was also available in a Hammerless double-action only version, and the Second Model Automatic Hammerless had an additional safety feature - a trigger lever safety. The lever sat in a groove machined in the trigger, and protruded through the upper half of the trigger. While the trigger lever isn't depressed, the trigger is locked. Therefore, for the pistol's safety mechanisms - namely the trigger lock to be disengaged and the transfer bar to be dropped and the cartridge unblocked - one had to intentionally pull the trigger. Sounding familiar? While Iver Johnson beat Glock to the punch with integrated trigger safeties by nearly a century, the Glock safety system is, in fairness, different. 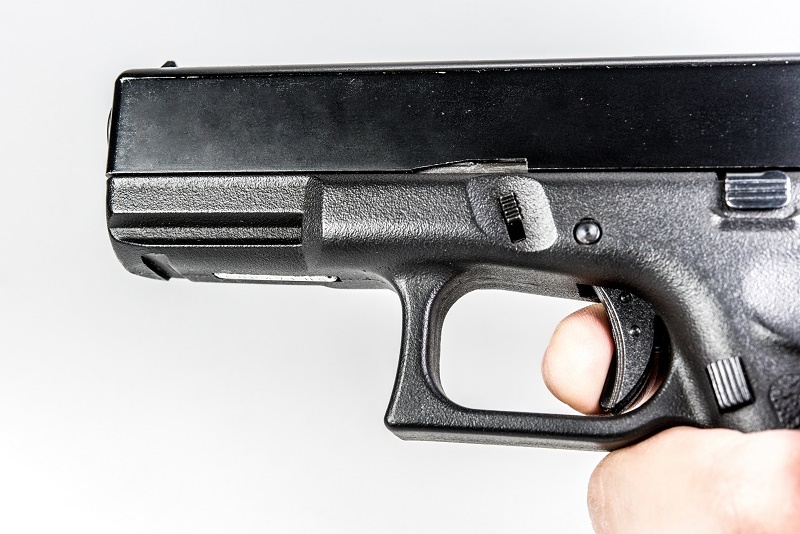 The Glock Safe Action system has three passive safety mechanisms engaged at once while the pistol is at rest, namely a trigger bar, firing pin lug and a firing pin channel block. 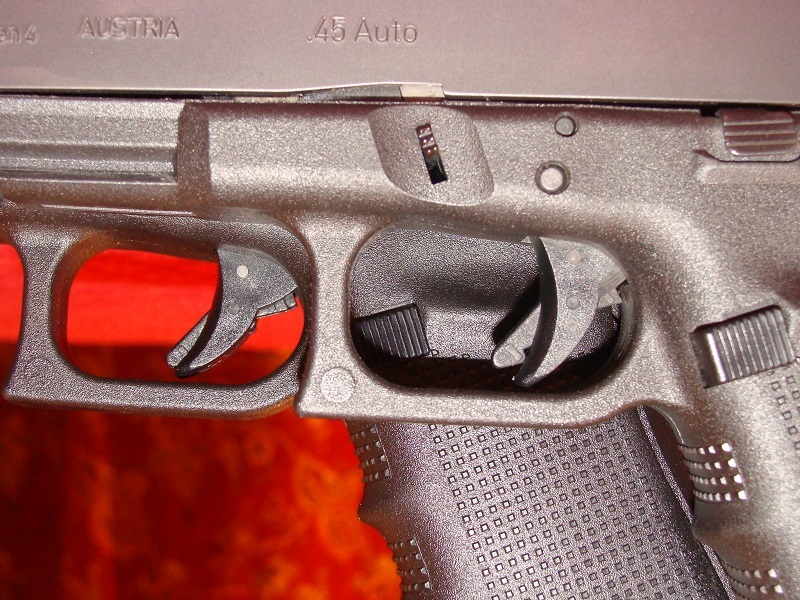 The Glock trigger bar is attached to the trigger hinge. This bar extends rearward from the trigger guard, and blocks a firing pin lug on the underside of the firing pin. Additionally, there is a firing pin channel block. The firing pin block extends into the firing pin channel at a slightly offset angle, blocking about half the channel. The block is a cylinder and about one-third of it is machined to a smaller circumference. While at rest,the block extends down into the firing pin channel, blocking the firing pin. The net effect is that when the pistol is at rest, the trigger bar cannot be moved. The resting position of the trigger bar blocks the firing pin lug, so the firing pin cannot move. Additionally, the striker end of the firing pin - which contacts the cartridge - is blocked by the firing pin channel block. Thus, the pistol cannot be drop-fired or fired by any action other than pulling the trigger. When the trigger is pulled, the trigger lever raises the forward part of the trigger bar. This releases the firing pin lug and raises the channel block, aligning the narrow portion of the channel block with the striker. This allows the striker portion of the firing pin to move, as it is no longer obstructed. If the trigger is fully pulled, the firing pin sends the striker into the cartridge primer, discharging the round. Naturally, other companies have made their own version of a trigger lever-actuated passive safety. While they may not all work exactly like Glock's, or for that matter Iver Johnson's, the basic idea is that trigger safeties work by blocking the trigger and the firing pin when the trigger isn't depressed. It is not the case that a pistol with only a passive safety - such as the Glock safety system - is more apt to accidental or negligent discharge. They are no more prone to one than any other pistol. It is more the case that any pistol is prone to being discharged if handled carelessly or otherwise without the respect that one should handle all firearms with. If you handle firearms with assiduity and a bit of intelligence, you won't have any problems. You must know, of course, that striker-fired pistols will discharge if the trigger is pulled. This means that if you pull the trigger with a loaded chamber, the pistol will discharge the round. If anything enters the trigger guard and you push the gun in a manner that causes the trigger to be depressed, it will cause the pistol to discharge. How, therefore, to avoid such an instance from happening? 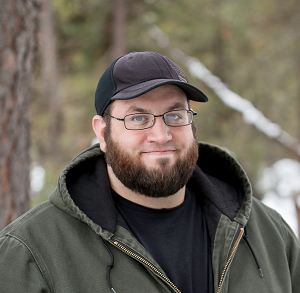 Check clear multiple times before pulling the trigger as part of takedown. Be darn sure before you press the bang switch. A lot of mishaps happen because someone didn't. That's why one of the rules of gun safety is "Treat Every Gun As If It's Loaded." Always make sure that your holster is free of obstruction when reholstering. Visually check and clear any garments before doing so. If something feels weird when reholstering the gun, STOP. Check to make sure everything is okay before proceeding. A bit of care will go a long way. It isn't that guns are inherently dangerous; it's that guns are dangerous if they aren't handled properly or if used maliciously. Naturally, Glock pistols and derivatives are as wildly popular for open or concealed carry as good, stout gun belts, but there are a few safety precautions one has to take if carrying a pistol with a passive trigger safety. Firstly and foremostly, the trigger guard has to be fully covered, at all times. Integrated trigger safeties work by preventing a discharge unless the trigger is pulled, how easy might it be for a trigger to get pulled? Easier than you might think. 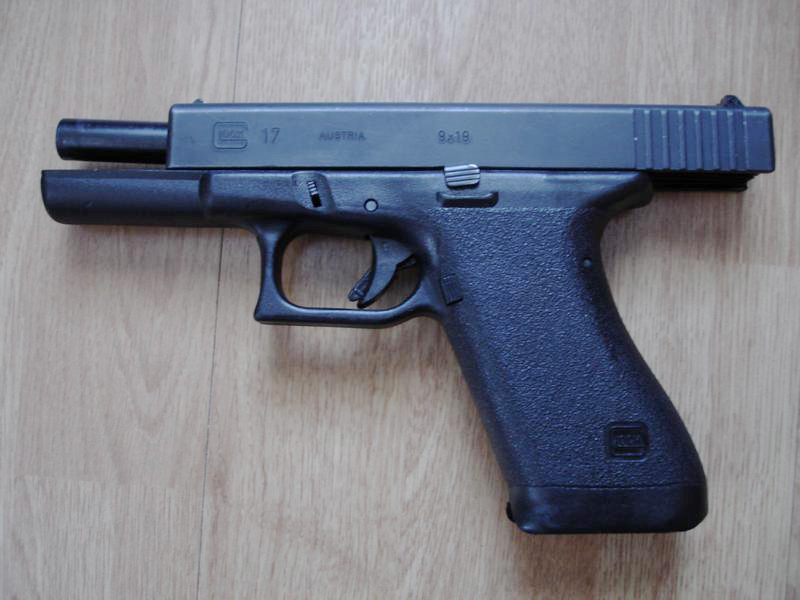 There are numerous reports of people accidentally shot with a Glock or similar pistol when a trigger is snagged. 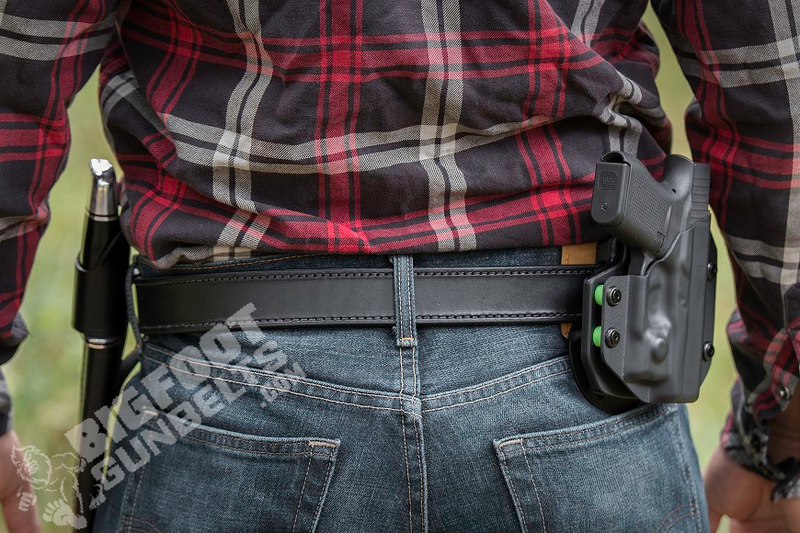 There are a number of culprits; some incidents took place because a trigger guard belt slide holster - little more than a fat leather loop that covers MOST of the trigger guard - began to soften with age and part of the holster dipped inside the trigger guard. Other incidents have occurred with a jacket drawstring or other article of clothing dropped down into an OWB holster and snagged the trigger, likewise causing a discharge. Likewise, mishandling such a pistol - such as careless placement of a finger near the trigger while drawing - can also result in a negligent or accidental discharge. However, so long as a trigger safety equipped pistol is securely carried and handled with the respect they deserve, they are perfectly fine.